Finally decided to get out and play in the snow. My son Brandon and I had a blast making this together. Lol....Air quality's not that bad out here in the country yet Bjs, but I'm not swearing it's going to stay that way for long......:-). Thanks Irish, my son hasn't helped me make one of these since he was a child, so needless to say, I loved every minute of it. brilliant Jerrie~ I hope it doesn't melt too soon! Thank you Arlene ! I'm afraid the only thing left now is it's belly...He and I seem to have something in common...lol. Wow ... that's a fantastic job! How artistic are you pair! Great Panda Flcrazy. You don't have to be leftie to be brainless. I can prove that. Brilliant very creative and I bet you both had great fun building him! I'm a leftie too. They say that left handed people are usually very adaptable and are also on the artistic side. Great snow sculpture. Thanks Sanbaz.......My father was left handed. I never got the chance to sit any exams at school 'cos I was sent out to work at the age of 15 in the early sixties. I do write now though and paint pictures to give away to charities. I was one of those who had her left hand tied behind her back when I was a child, parents got tired of trying to encourage me to write with my right hand. Needless to say, I won out. I refused to pick up a pencil with my right hand. So Toto, I'm apparantly not only brainless, but extremely stubborn too....lol. Must admit though to giving in to doing alot of things with my right hand, because I finally got tired of trying to learn how to do EVERYTHING in what seemed like reverse.....;-). My teacher at school tried to get me to write with my right hand and I became very frustrated and in the end my mother told the school to let me write with my left hand. I can write with either hand though even now.Why the school's thought that everyone should be the same I don't know. I'm right handed, not to say right bodied, actually - I find my left hand absolutely useless for almost anything (other than typing, that is) except strength and stability, but my sister is a leftie when she writes - and is able to use scissors in either hand! I reckon lefties are more inclined to be usefully ambidextrous, how great must that be, I can't even paint the fingernails on my right hand properly, the left hand's so hopeless with fine motor movements. One of my sons is left footed (kicking a ball) and leftie golf player, but writes with his right hand... I can't see it matters, as long as you can manage everything somehow. I have had to learn to do things with my left hand since I injured the middle finger on my right hand 16 months or so ago.Took some doing but I got there!! Very nice but he looks a little lonely how about making him a companion? Love your Panda Jerri...and all this left handed talk made me think of when I was a teen in love with Paul McCartney..he is left handed..so I decided I should be too..lol..I taught myself to write left handed...still can do it when I want to..but I am a righty..although I do believe that it left me a bit ambidextrous.. I think you will appreciate this quote..I used to carry a marble tile in my shop...I ordered it by the dozens over and over again...it sold very well! This is what it said on it. only the gifted overcome it." Thanks everyone ! So glad to hear all the positive feedback for all us lefties. Keep it up and I just might be inspired to rule the world...lol. Catfinch, I just LOVE that tile.... Now I want one.... lol. Well Andrew, I don't know about you, but I'll just have to get that printed on something and hung on my wall. It's my new 'must have' item at the moment...lol. That would be an excellent party trick Sid. I'm very intrigued now....lol, I've never heard of anything like it before. Sounds really cool ! Thanks for the heads up Catfinch, I'm off the check it out ! Excellent job on the panda!! Sooo cute! How long did it take you guys to create him?? Thanks CharlieB ! We spent about 40 minutes on it the first day shaping the bottom section and belly, but the snow was too dry to sculpt the arms so we went back out the next day after the snow had started to melt alittle and spent the next 30 minutes making the arms, head and ears.Only took a few minutes to mix up the food coloring and spray it on. Guess it took about an hour and twenty minutes total. We were having so much fun it seemed to be over in a heartbeat. Brillaint thanks for sharing your fun. Wow! the family that sculpts together, aye? brilliant job...and I'm a leftie too... that means that you are right brained!! it's the seat of creativity...and don't you show it!? Your family is very artistic...I remember your creative brother with the welder and machine parts creating some excellent sculpture! It seems that mirror writing, ambidextrousness (or should that be ambidextrousity).?? lol... is very common among us. I play golf right handed though... and tennis... funny. might explain the complete mediocrity of my performance! but for most other pursuits,( eating, writing, drawing) either hand will do! Thanks Tasteyg, glad you like it. Wow Lori, the more I find out about you, the more I'm positive you are my lone lost sister...lol. I don't think you could possibly be mediocre at anything you've ever attempted to do ! 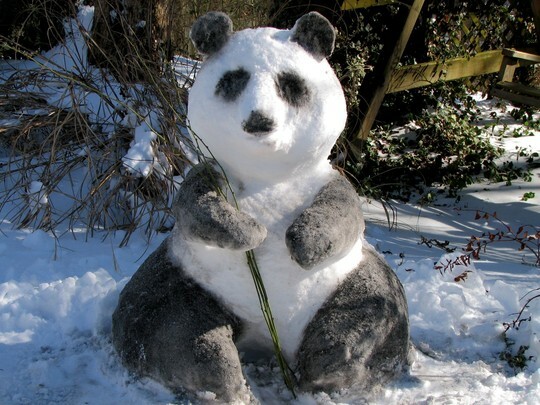 I've never seen a panda made from snow....remarkable! I'm going to send our daughter a link to your photo (she adores pandas) and it will give her a smile! I also love your garden...oh to have the space to develop a garden like that! Well done! Thanks Whistonlass, I hope your daughter gets a kick out of it too..! It says alot about you, that was a thoughtful, sweet jesture. Glad you like the garden too. Gardening is my go to for stress release, and as you mentioned the size of my garden, you can see I apparantly have alot of stress that needs managing...lol. Thank you for the kind comments and your welcome, Flcrazy. I am loving GOY, despite being a frustrated beginner at anything gardening related. I'm off to get some pots (hopefully in the sales) so I can plant up some violas I got on the weekend....that should look nice. Sure lots of ideas here on GOY and beautiful gardens too. Hi michella, I'm fine, thanks for the thoughtful comments ! I've been busy remodeling the house this year. I haven't had much time for the garden this year and boy does it look like it...lol. I'm doing all of you a favor by not posting any pics this year...:-). Whistonlass, this is the perfect time of year for bargains isn't it ! It's my favorite time of the year to pick up garden accessories. I too was blown away by all of the talent on GOY. So much to learn, so little time ! BTW, I'm sure you are already a pro at gardening.....;-). Gracious that's awesome - very artistic talent there! Thanks Paulsgarden and Linsuffolk. This has become alittle tradition for my son and I over the years. We're starting to run out of ideas of what to do next....lol. have you done polar bear??? No, but we've done a replica of a stuffed blue bear my husband's parents gave my son on the day he was born. It is beautiful and the envy of my grandchildren they think it is amazing! Thanks Marydoll, I'm delighted to hear they like it ! Hopefully they will make one of their own this Winter. Children are so creative. This is wonderful Flower crazy. I'm about to email my grown-up sons your panda, as I know they'll love it. I smiled at what you said about your son's room . . . we still keep one of their bedroom walls un-redocorated to keep the "world map" which one of them drew. Happy New Year - look forward to seeing you again on this marvellous site! Both my maternal grandparents were ambidexterous. Of their children, eight, none were lefthanded. Of their grandchildren, all but one of those were lefthanded, and I am the only lefthanded girl of all those 7 first borns. Lefties are more artistic and more adaptable. Probably because we have to learn early how to survive in a right handed world. Can't always be true, Rustyshovel - I'm right, my sister's left/ambidextrous - she's about as creative as a cardboard carton, no idea, comes to me for creative stuff, lol! My husband remembered this wonderful snow panda from last year (when you put the picture on), and just found it on Google . . . we were talking about making a "snowman" the size of our tiny granddaughter, as we have snow forecast for tomorrow. Nothing could be as brilliant and original as yours though Flcrazy! Is your granddaughter a new addition to the family ? If so, Congratulations !!! Trust me, your snowman will be priceless to her. Best of luck with the snow forecast, and I hope to see a post of it on GOY. Thanks Flcrazy! Yes . . . our first grandchild, just arrived from Australia and 8 months old, so just a bit too young to play in the snow (she'd probably love it though). We've had a good inch of it, and she's just being taken out in the buggy for her first experience of the snow - with the camera! That's wonderful ! She'll love those pictures in her future years and will cherish the stories that go with them. I bet you"ll have to pull them out and retell those stories every time she comes to visit in the years to come. That always makes for some awesome quality time together. Wow I just love this as I love Snowmen but more I love and collect Pandas always have since a little girl one day I hope will get to see the real thing. Hi, this is FABULOUS. At a glance, I thought you had taken a large cuddly toy, sat it in the snow and stuck a branch under its arm. ..... There is obviously a lot more to it than that. I bet Brandon enjoyed this little project. Only a SHAME it won't be around in the summer, for you all to admire.